The People’s Republic of China regained sovereignty over Macau in 1999. Macau’s status as a Special Administrative Region will last until 2049. Macau’s unit of currency is the pataca (MOP), but in most areas Hong Kong dollars (HKD) are accepted. The Chinese Renminbi (RMB) is increasingly accepted. Macau’s official languages are Cantonese and Portuguese. However, Cantonese is the predominant language spoken, and in tourist areas many people can speak English. Citizens of many countries, including the United States, Canada, the United Kingdom, and European countries, do not require visas to enter Macau for a limited time. Passports and valid travel documentation are required. Just a short ferry ride from Hong Kong, Macau is known as the Las Vegas of Asia, with enormous hotel and casino developments. Most of the casinos are located in the Cotai Strip on a stretch of reclaimed land connecting Macau’s Taipa and Coloane Islands. Modeled after the larger Las Vegas Strip, the Cotai Strip features glitzy casinos, world-class hotels and resorts, upscale shopping and fine dining, and other properties are also located near the Macau Tower and the ferry terminal. The largest of the 33 casinos is the Venetian, a newer but similar version of its sister property in Las Vegas, but other distinctive casinos in Macau include the Grand Lisboa (viewed above), the Wynn, the Sands, and others. In addition to casinos, the Cotai Strip hosts world-class entertainment. Cirque du Soleil’s ZAIA is at the Venetian, and huge entertainment venues host musicians and performers from all over the world. At night, guests can dance the night away at trendy nightclubs, such as D2 and Sky 21 on the second and top floors of the AIA Tower, respectively. Fisherman’s Wharf on the waterfront next to the Cotai Strip is prime real estate for trendy nightlife, with bars, karaoke clubs, dance clubs and restaurants. Beyond the glitz and glamour of the Cotai Strip, Macau has an old-world charm of its own, best glimpsed on Coloane Island, where fishing villages and temples mingle with centuries-old Portuguese chapels and Macanese restaurants. This is the best place to sample local cuisine and Macau’s famous Portuguese egg tarts. 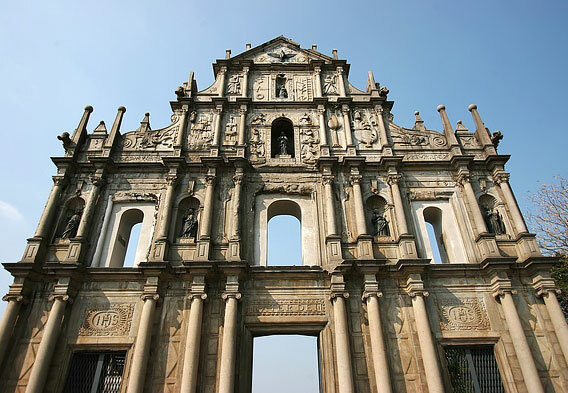 The Ruins of St. Paul’s are one of the most distinctive sights of Macau’s historic center. The façade of St. Paul’s Cathedral, a seventeenth-century Portuguese cathedral, is the only standing part of the church that remains. Built between 1582 and 1602 by the Jesuits, the cathedral was once the largest Catholic church in Asia, and its intricately carved architecture is quite a sight as it towers over downtown Macau at the top of a hill. Despite calls for the leaning structure to be torn down toward the end of the twentieth century, the cathedral has been renovated and turned into a museum. 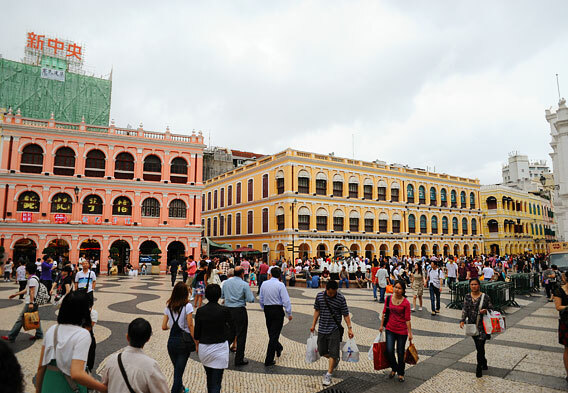 Senado Square is another distinctively Portuguese-influenced historic attraction in the heart of Macau. The wavy black and tan stripes of the pavement are surrounded by historic European-style buildings such as the historic Post Office, the Senate Building, and St. Dominic’s Church, and the main road of the old city, the Avenida de Almeida Ribeiro, passes through. The square, whose name translates to "Senate Square," is part of the designated historic center of Macau, which is a UNESCO World Heritage Site. 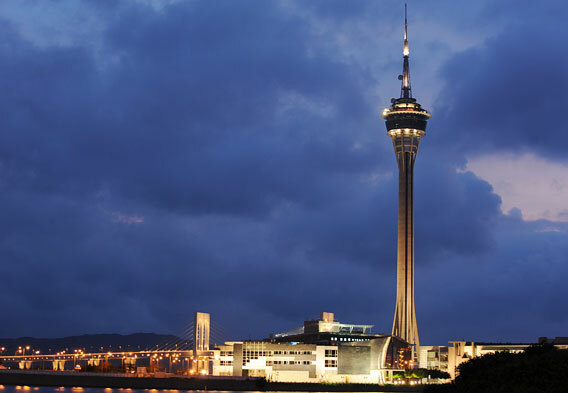 Macau Tower embodies the modernity of Macau. The telecommunications tower was completed in 2001 and is a favorite spot to get a panoramic view of the city. Daring tourists may wish to try the tethered Sky Jump, the bungee-jump from the top of the tower, or the Sky Walk, a guided walk around the perimeter of the tower’s outdoor deck. There are also many restaurants and shops on the observation deck. Getting to Macau is relatively simple via one of the high-speed ferries from Hong Kong. You can take a ferry from the Hong Kong-Macau Ferry Terminal in Sheung Wan, Hong Kong, or from the China Ferry Terminal in Tsim Sha Tsui, Kowloon. Your ferry will be either a hydrofoil or a catamaran-style vessel, and if you have a preference in styles, you may ask for a specific ferry at the ticket counter. The boats are very comfortable and the journey takes about an hour. The sprawling complex of casinos can be intimidating at first glance, but luckily, an efficient free shuttle system transports tourists to and from the ferry station and between the hotels, making it easy to get around. Taxis are relatively cheap and are an easy way to get around, and should you wish to explore beyond the Cotai Strip, the local bus system is in English and is designed for tourists to get to the main sights downtown.